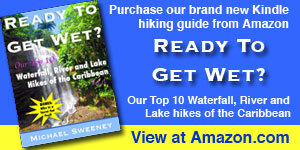 Join us on this hike, even if you’re not in Grenada! As I mentioned in my last post, our plan yesterday was to travel to the north end of the island to, once again, hike to the spectacular Tufton Hall Falls, the highest waterfall in Grenada. Mother Nature must have known that we were itching to do something fun because she cooperated brilliantly, providing us with a rain-free, sunny day. A good weather day is of particular importance when doing this hike as, at times of heavy rain, the river we walked up can be susceptible to flash floods. This is evidenced by the huge trees we saw criss-crossing the water in many places, having been washed down stream in months and years past. In the hiking guide we wrote, Ready To Get Wet, I listed this hike as a 5 out of 5 difficulty. Now, after completing it a second time, I would still concur with our initial assessment. While much of the hike is of no greater difficulty than a typical Saturday hash here in Grenada, there are other spots that are particularly sketchy, most notably the high cliff close to the end which must be ascended (and later descended) by completely relying upon a fixed rope. Remembering what a sorry state the rope that I just mentioned was in the last time we did this hike, we brought a new one with us this time around to add to the tree. I volunteered to climb the cliff first using the old one, and once at the top of the cliff, I rigged the new one for the rest of our group to use. Even with that new length of line, watching other people make the ascent put serious butterflies in my stomach. Not only could falling produce a very serious injury, like many of the jungle hikes that we do, medical care would be hours and hours away. That far in the bush, you are truly on your own. So why take the risk? Look through the photo gallery I uploaded and that question may be answered. This waterfall is spectacular, but so remote that very few people get to see it. That beauty, and the challenge, is what drove us to make the trek. While I didn’t quiz them, I’m guessing that our excellent hiking companions Steve, Mark, and Lisa might have similar thoughts. A tandem charter — when two boats are better than one! Next PostA bunch of itchy hikers. Could it be chiggers? My new WordPress plugin is complaining that this blog post includes too much “passive voice.” I had no idea what that even meant so I had to look it up. After reading that, I still don’t know! Flashbacks to high school English class. Anyone familiar with this concept feel like pointing out one or two of the ill-written sentences, and perhaps suggest a non-passive alternative? Wow guys that looks stunning! I am a little afraid of heights but the waterfall would definitely be worth overcoming that fear! Great pics of the day. I have a question for you about hiking shoes. My hubby and I are finally taking off on our sailboat for a year and heading to the Caribbean (woo hoo!) Packing has been tough to say the least because I do not want to take too much stuff. We have our heavy hiking boots packed, you know the leather boots with full ankle support. I see you have much lighter shoes on in this hike and you have me wondering if I need my boots? What do you think? We only have two pairs of shoes each: running/trail shoes, and flip flops. Maybe it’s all the incorrect use of italics that is the issue with the passive voice? But since you brought it up, what do you consider the correct use of italics? I don’t see any obvious passive voice. This is when something “was caught” or “was delivered” or “were eaten”…anything like that where it isn’t clear who is doing the action. The only thing I see is the first sentence “our plan was to…” could be more active if reworded “we planned to..” so maybe there are some other sentences like that. But I probably wouldn’t worry about it because your meaning is clear. Re italics, I find it interesting that you italicize all proper names. In formal writing (at least in the US), italics are for books or journal titles in citations. Or they can be used in place of ” ” for quotes of what someone says. I like the distinction of how you use them to make names stand out but it is unusual and maybe it is confusing the plugin. Just my ideas! I really enjoy your blog and am super jealous. Would love to live the cruisin life someday.